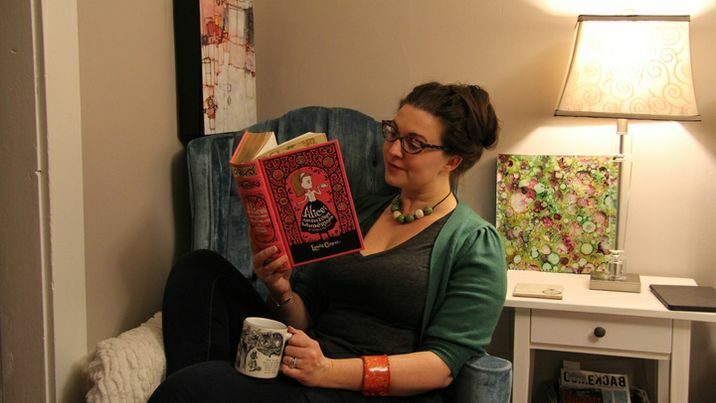 Bridget van Voorden lounging on her vintage turquoise chair reading Alice’s Adventures in Wonderland & Other Stories by Lewis Carroll and sipping from her Alice mug. Imagine if you could return home after a long day of work to your very own Wonderland. 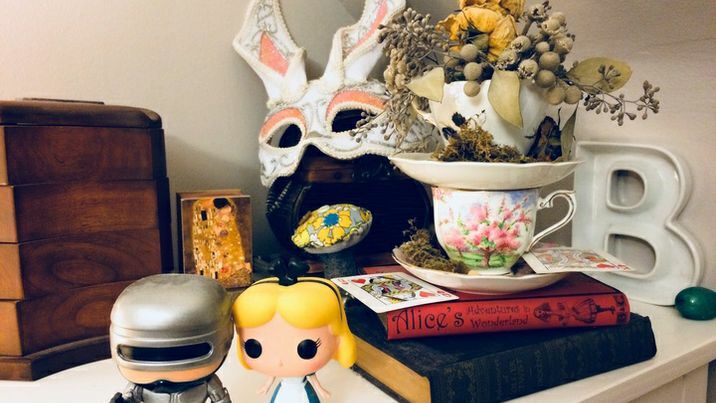 For Kobo’s Executive and Legal Assistant, Bridget van Voorden, literary classics Alice’s Adventures in Wonderland and Through the Looking-Glass by Lewis Carroll are more than just books, they are the ultimate inspiration for her bookish home décor. She fell in love with the stories as a child, and trinkets collected through the years soon became conversation-pieces that she couldn’t resist placing throughout her home. 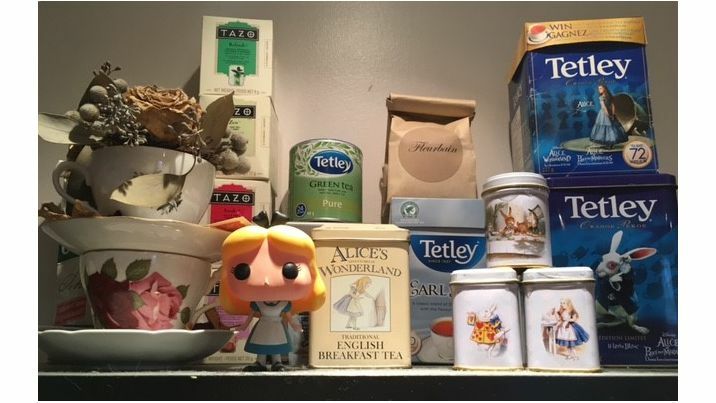 Stepping into the 1918 Toronto East carpenter house that she and her husband, Cory, bought from her parents in 2015, is like going down a rabbit hole into a dimension filled with Alice-themed art and collector’s items. From the front door itself hangs a framed picture of a keyhole that hints at the otherworldly wonders inside. The first piece of Alice art that catches your eye once you’ve entered is a yard-sale painting that Cory, who works in animation, used as a background on which to paint his own Alice scene. The effect is both surreal and quirky. While there is much evidence of the sweet side of Alice throughout the house -- you can often catch Bridget reading on her grandmother’s turquoise chair upstairs while sipping on tea procured from one of her Alice tins -- her cat Dinah (named after Alice’s) lounges in the living room under In the Death of Happily Ever After, a framed photograph by artist Alice Zilberberg, which depicts a tormented version of Alice. It’s from the living room that you get the greatest glimpse of the bookcase that houses everything from Wonderland-themed cookbooks, to plush characters (Mad Hatter and Cheshire Cat) to an extensive foreign language collection of the book itself. 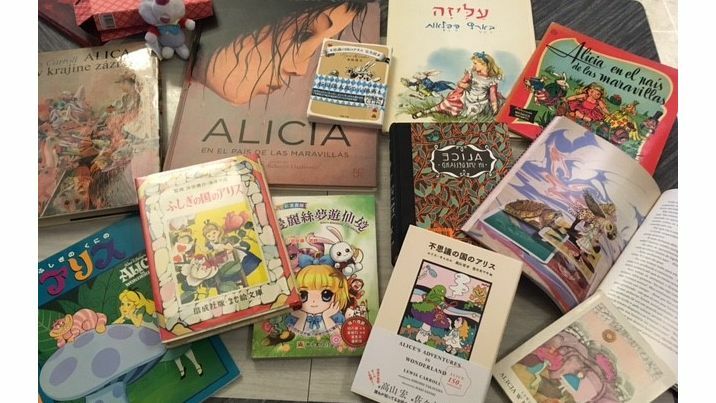 One of the most eye-catching items is a large Spanish version of the book, Alicia, with illustrations by Rébecca Dantremer. Its beauty is rivaled only by a surrealist print of Salvador Dali’s Down The Rabbit Hole showcased near the entryway. 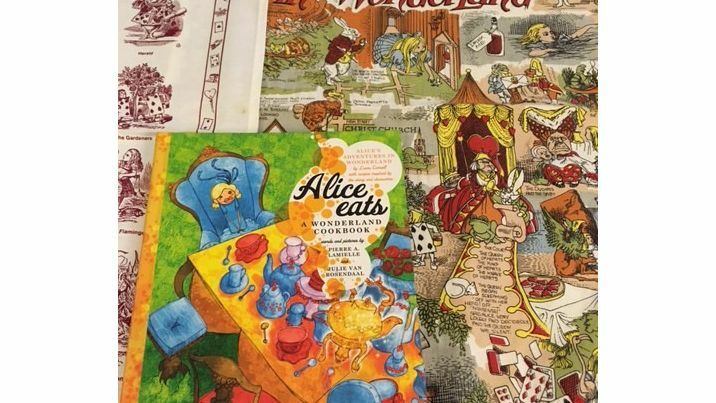 The kitchen is a topsy-turvy swirl of Alice-themed dishtowels, teapots, coasters and even a three-tiered pastry tray, all of which give you the sense that if you nibble on something in there you would shrink or double in size. Not to be forgotten, the adjoining powder room even has a melting clock. If you follow the direction of the framed rabbit at the foot of their staircase leading up to the bedroom, you’re in for one last treat. Although Alice can be seen as a symbol for independence, she was also a huge part of the theme of Bridget and Cory’s 2014 wedding. True to form, on the bedroom dresser you can spot a couple of vintage teacups stacked on top of each other with flowers and playing cards that they used as their wedding pieces. Even the couple’s wedding cake toppers are Funko Pop figurines of Alice and RoboCop (Cory’s favourite) an unlikely pair that nonetheless look great together. It is reminiscent of the pairing of both high and low art throughout the house, blending together to create something altogether charming. Although the giant clock downstairs above the kitchen entryway may indicate that it’s time to go, you get the sense that both the house and its inhabitants have many adventures left in store for them. 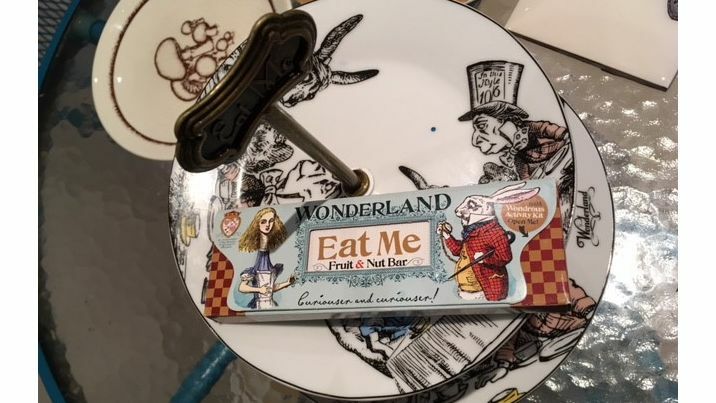 I, for one, can’t wait for my next visit to Wonderland.